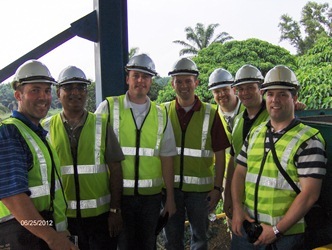 Eddie Arauco, Sakthi Mahenthiran, Jon Jones, Nick Gaughan, Zach McCoy, Ned Torson and John Lane at a palm oil plantation in Malaysia. In June 2012, seven lucky Butler University MBA students took a six-day trip to Malaysia that allowed them to get a rare glimpse at business practices overseas. MBA students Zachary McCoy, Ned Torson, Jonathan Jones, John Lane, Desiree Lane, Nicholas Gaughan and Edmond Arauco attended the trip with Sakthi Mahenthiran, Butler’s Carl Doty professor of accounting. The program was packed full of activities, starting with a seven-hour lecture series at Monash University on day one. After the lecture series, the students went on company tours, to places like Nissan Automotive and Palm Oil Economics, where they got to take a look at Malaysian business practices first hand and speak directly to some of the country’s top businessmen. The tours were the selling point of the trip for Arauco and fellow students Ned Torson and Nick Gaughan. Gaughan agreed, and said every business “really rolled out the red carpet” for the MBA students. He said the open-door policy they were greeted with allowed him to clear up some misconceptions about Malaysian business that he went into the trip with. Arauco said that he too was fascinated by just how different management styles are between Malaysia and the United States. He said he walked away with an appreciation for the way things work in the United States. He also walked away with the understanding that success—especially in the business world—is fragile. Mahenthiran planned the trip so students would see exactly that. Mahenthiran, a U.S. Fulbright Scholar in Malaysia from December 2002 through July 2003, returned to Malaysia again in 2010 when he served his sabbatical at Monash University—Sunway Campus. At Monash, he was able to form connections with influential people like senior lecturer Jane Tong. Tong, who specializes in international management, helped Mahenthiran work out the logistics of the trip. Mahenthiran said he “could not have done it” without her. Tong is now currently living in Indiana, serving her own six-month sabbatical here at Butler. Mahenthiran said a trip like this “tries to get away from Western-centric thinking, and to show a point of view that is more Eastern; because when we say ‘Real Life, Real Business’ we mean it from a very global perspective,” he said. Arauco, Gaughan and Torson said they hope Butler will offer more trips like the Malaysian program.